Question - How long should the ramp be? Answer - There are no rules defining loading gradients but sara always recommend 30% (16.5 degrees). Simply multiply the bed height of your vehicle by 3.3 to give the optimum length. If you need your ramps to access buildings, whilst using a wheelchair for example, then simply use the height of the step or steps as your height difference. The recommended gradient for public buildings is 6%. Question - Should I allow extra capacity in the ramps for safety? Answer - No. All sara ramps are made to European standards, which require us to build in a 100% safety factor. Question - How durable are aluminium ramps compared to steel? Answer - If the ramps are used sensibly, there is no reason why aluminium ramps should not last as long as steel, and longer than steel ramps with wooden inserts. Question - When in use, how do I secure the ramps to my vehicle? 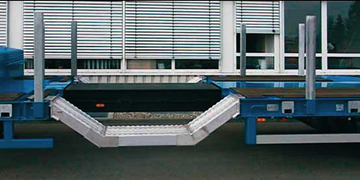 Answer - All pedestrain ramps, and plant ramps up AVS 130 are supplied with our movable safety devices that slide in the aluminium extrusion under the loading lip. This device should be placed between the lorry bed and the tailgate. Once this is in place the ramps will not shunt during loading. Another option is to use the drop bolts supplied. The loading lips of the ramps are pre-drilled to accommodate the bolts. The VFR low loader ramps have underside tie bars for attaching a chain or strop. Question - What if I need a specific length or width? Answer - Standard size charts are shown with each ramp. Non-standard sizes are generally no problem. 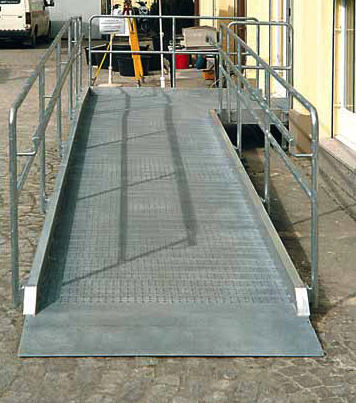 We can make the ramp to any length you require and the width can be increased within reason. Question - Can sara manufacture special applications? Answer - sara manufacture a wide range of aluminium extrusions and have been able to solve many unusual loading problems. Previous projects include purpose made trench ramps; temporary bridges and aluminium rail systems for concrete laying equipment. We can also manufacture bespoke ramps for wheelchairs. See the wheelchair access ramp below. Question - Can I load steel track equipment? Answer - Yes, all sara's AVS ramps can be made to take steel track machines. However, our VFR low loader ramps are designed to take steel tracks as standard and may be a cheaper alternative to the larger AVS sizes.